Binary options trading provide you with an opportunity to trade stocks, currency and commodity options using a simple platform interface using one mouse click. In contrast to standard investing, binary option (BO) trading offers you an extremely clear picture of pre-determined ROI. This is an excellent chance to command the gains and control the potential risks. It is not the market but instead you who really makes a decision on just how much you may risk and what is your preferred gain results. 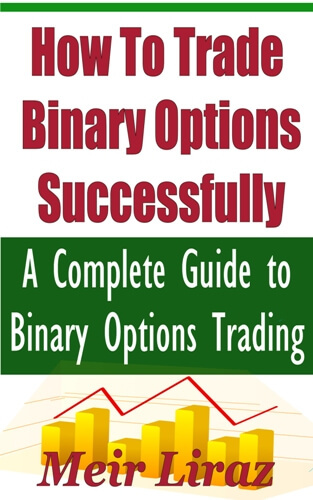 The purpose of this binary options eBook is to show you how to make money trading BO. BO are a popular investment instrument for trading stocks, commodities and currencies. Trading Binaries is very simple and straightforward, all you need to do is decide which of the two directions the asset will move, up or down. And binaries has quite a high profit potential. BO allow even beginners the opportunity to succeed with financial trading. Actually people that have minimum financial track record can easily make money by learning how to trade options online. This trading binary options for dummies PDF features the in and outs of BO as well as strategies needed to achieve success in trading binaries. The single most critical factor to binary options strategy success - ignore it at your own perils. How to prevent falling prey to a dishonest broker. Simple, easy to copy ideas that will enhance your chances of winning trades. binary options strategy. How to spot a scam. What you need to succeed in BO. Advantages and disadvantages of trading BO. Effective risk management strategies to help you minimize your risk and conserve your capital. Key factors to successful financial Binaries Option trading. How to develop BO investment strategies and entry points signals that work. A list of easy-to-follow tips to help you improve your trading successes. How much money you need to start trading. The purpose of this 'how to trade binary options successfully' book is to show you how to make money trading Binary Options. In the first several chapters we will deal with the in and outs of BO while later on we will go into the strategies needed to achieve success in trading binaries. So what are Binary Options (also referred to as 'digital options', 'fixed return options' and 'all-or-nothing options')? A binary option is In fact a prediction of which direction the price of the underlying asset (a stock, commodity, index or currency) will move by a specified expiration time. With Binary Options, an investor doesn't purchase the asset - he is merely predicting the direction that the underlying asset moves. There are actually just two possible outcomes. A fixed gain if the option expires “in the money”, or a fixed loss if the option expires “out of the money.” The price of the asset is not important. The only thing that is matter is whether the prediction is correct or incorrect. First, you choose a trade expiration time, this is the time you want the trade to end. It could be any time period between a minute and a week - usably it is within the day. Second, you choose Call or Put. If you think the price will end up above the current price: you click the buy/call button. If you think the price will end up below the current price: click the sell/put button. Now that the trade is placed, you simply wait for the outcome. If the trade expires 'in the money', you make a profit. If it expires 'out of the money' , you'll lose. Now you can see where the "binary" comes from, it stresses the fact that there are two possible outcomes to a binary option, both of which are set and understood by the investor prior to placing a trade. You purchase a Google binary option for $25, with the opinion that within 2 hours Google's shares will be higher than they currently stand. If you are correct you get a previously set percentage return on your investment (e.g. 82%), should the shares go lower you lose your investment (some brokers will give you back a small amount as a "refund"). A number of factors distinguish binary options from regular stock options. In regular stock options, a trader will pay per contract. Therefore the investor may profit or lose a sum based on the quantity of points difference between the expiration level and the strike price. In contrast to binary options in which the two outcomes are actually set from the beginning. An investor in a binary option needs to hold onto his option until the expiry date. He must consequently take more care when ever buying his options as he is unable to sell them after they are purchased. Binary options are categorized as exotic options, however, inside financial markets they sometimes are termed as digital options. While digital options are quite simple to understand and easily traded, the mathematics behind the pricing is complex. It is because of this that digital options are referred to as exotic options. For years Binary Options were traded by large institutions and their clients in the over the counter market (OTC). In 2008, the Securities and Exchange Commission in the US approved the listing of binary options with continuous quotations and now binary options are also available to individual investors. Tags: trading options for dummies pdf, how to trade binary options for beginners, binary options ebook.